As recipients of the Salome Raheim Award in 2015, we enjoyed the privilege of having Salome Raheim, who is a Professor and ex-Dean at the University Of Connecticut School Of Social work, to come and visit Singapore. The purpose of the visit was to exchange knowledges across very different contexts (The United States and Singapore) surrounding narrative practices in addressing privilege and dominance. Salome has extensive experience in teaching ideas in cultural competence to improve the quality and effectiveness of health care and human services, on top of integrative mind-body-spirit approaches in health and healing. In Singapore, cross cultural competency training has generally revolved around attempts at better understanding the cultural nuances of the official ethnic groups in Singapore. These are generally defined as Chinese, Malay, Indian and Others (typically Eurasian). Although useful in some ways, these forms of understanding do not shed light on how issues of power and privilege come into play within various social locations such as gender, race, sexual orientation, age, class, and more. This was an area that we hoped that Salome could share more about, and hence unlock important conversations towards better collaborative practice in Singapore. 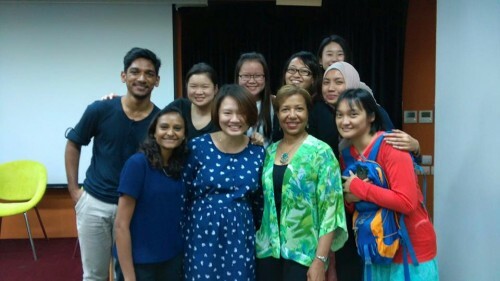 Salome was gracious with her knowledge, agreeing to conduct a full day workshop on cultural competence and privilege for social service practitioners, and participate in our Singapore Narrative Conference which was held in July 2015. As a bonus, Salome had also conducted a half day workshop at Cheng San Family Service Centre to talk about ways to build organisational cultural competency. We appreciated Salome’s consultative and collaborative position, where she took time to understand Singapore’s culture and the overlapping intersections of social locations embedded within the official cultural groups. We talked about social issues, and even went to the Malay heritage centre, uncovering alternative stories about the economic growth and participation of the Malays. This hidden knowledges stood against the dominant discourse that the Malays were economically “backward” before the British took over (Singapore being a vassal of the British empire for more than a hundred years from the 1820s to the 1960s). During the workshop, Salome adopted a respectful position, and collaborated with participants to bring to light the operations of privilege in Singaporean society. It was rare sparkling moment, where individuals from the more dominant social positions started speaking about their positions of privilege. For example, a workshop participant who was female, discussed about how her gender might be marginalised in the workplace, but at the same time, she was part of the dominant Chinese cultural group, which put her at a higher social position that her counterparts from minority ethnic groups. Her willingness and courage to acknowledge her social position, created a safe environment for participants to talk about the challenges they experienced from social positions of lesser privilege, for e.g. being from a minority group, or not supporting the dominant political party, etc. At Cheng San Family Service Centre, conversations centred on how the agency would be able to adopt policies, behaviours and attitudes amongst professionals that would support the addressing of privilege, as well as ways of working effectively in cross cultural situations. Staff started being aware of the effects of micro-aggressions, which may be said without ill-intent by those in higher positions of privilege, but yet could be hurtful for those on the receiving end. This include attributing a female colleague’s anger as due to her “post-menstrual stress”, or making jokes that may poke fun at one’s racial identity. The team from the Family Service Centre were also invited to explore ways to commit to fostering diversity, inclusion, and equity in the workplace, and create organisational structures and policies that would support cultural diversity. Plans were made to create a policy document on the ethics of diverse practices. The team had also discussed intentions to kick start a platform where members of different and social locations would be able to come and share about their journey against discrimination, and also to share tips and ideas with social workers with regard to working effectively across diverse groups. Although Salome came only for a week, but her ideas were important seeds to catalyse further growth in the realm of cultural competency in Singapore, paving the way for future conversations to address power and privilege in practice. My grandmother was 10 years old when she was separated from her parents and her siblings during the World War 2, when Japan forces had attacked her homeland, in east Java. She walked 370 miles to West Java with 2 siblings and a relative, then joined a boat that took days to get to the similarly war-stricken Singapore. Since the days of war, all through to turmoil during pre-independence, she lived day by day not knowing if there would be enough bread for her 7 children. On the day our late PM Lee woefully signed the agreement to separate from Malaysia, my grandmother lost her husband to bronchitis, and quite possibly cancer (who knew those days). Since Singapore is celebrating our grand 50 years of independence this year, my grandmother celebrated her husband’s 50th death anniversary. For the last 2 decades, she celebrated his death anniversary in a fancy 2-storey terrace house, completely paid off by her daughter – my iron-fisted mother. Salome, thank you for introducing to us who you are and helping us understand exactly ‘who’ you are. I’d like to introduce you to myself too. I am Naadira, a social worker recently introduced to the wonderful world of narrative therapy. I am also the 1st generation free from poverty in my family. I have never wondered if there might be bread on the table for breakfast, cause its rhetorical in this house. [And I don’t even eat bread cause I cannot stand the smell, a fact my mother cannot tolerate]. I eat nutritious cereal for breakfast, sometimes even going for seconds. I sheepishly hide the fact that I had never had to work for my tertiary education, or get a loan like my other Malay peers. With all the privileges, and also luck in my life, I instantly connected when you talked about understanding my social position. You’ve opened up a world of understanding people, and myself, in ways that are respectful and just. I truly appreciate what you’ve left lingering in my eager mind. 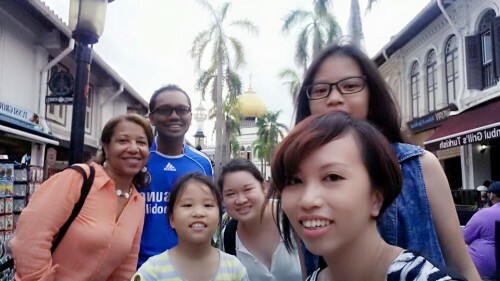 In 2014, during our first intensive in Adelaide, as part of the Master of Narrative Therapy and Community Work, Fareez Mohammed and I approached the Dulwich Centre Faculty to speak about our experiences of racial dominance in Singapore, and how difficult it would be to speak about this where we saw that such conversations are impossible to have. Reading the Invitations for practitioners to talk about dominance and privilege was extremely enlightening article for me. It provided me a language and way of understanding what my clients were experiencing, I, being from a middle class and Chinese background and my clients having neither. We were very excited to have the Salome to come down to Singapore, to talk about opening up some conversations and wriggle out some solutions to starting these conversations. All of us, to a certain extent were working hard to challenge cultural dominance in our own capacity in our family service centres. During Salome’s workshop, I truly appreciated how Salome used various ways to help us to reflect upon these ideas, including using her own personal history and relationship with these ideas, as well as various discussions and exercises to reflect upon our own social locations and when some aspects are similar to those we work with. This open up spaces for discussion and understanding. I personally have used this to reflect on my own social location, and how this would impact on my work and relationships. As a social worker, a supervisor and an occasional educator, I’m grateful to Salome for sharing these helpful skills and language in which to discuss this complex issue with great warmth and big heartedness.